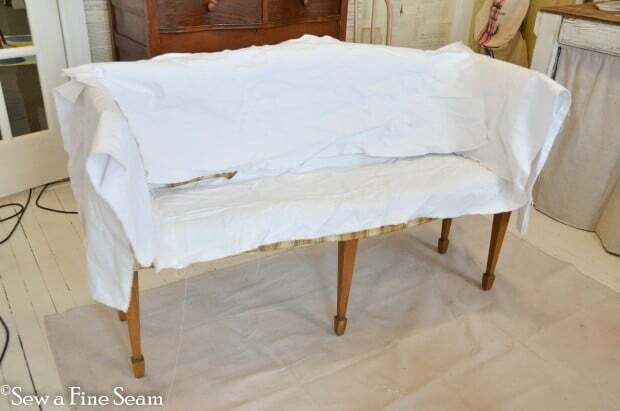 This is the bench she wanted covered. She has a spot for it in her house that is gonna be so cute when they get the makeover of the area completed. It will be a spot to take off or put on your shoes/boots before you head out into the outdoors. Pretty simple to give this piece a facelift in the form of a slip cover. 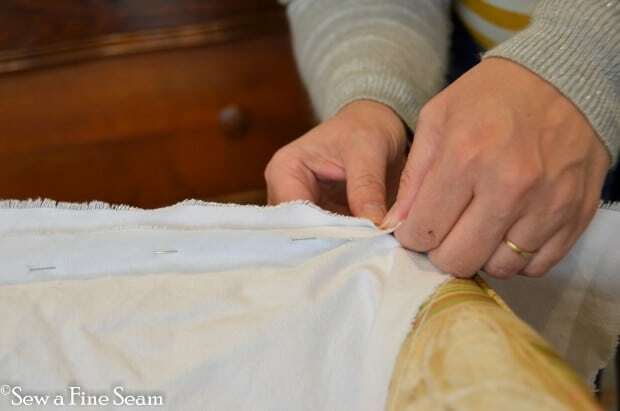 I started by tearing the fabric into pieces that would work for each section. Laura enjoyed taking pics of me on the job! 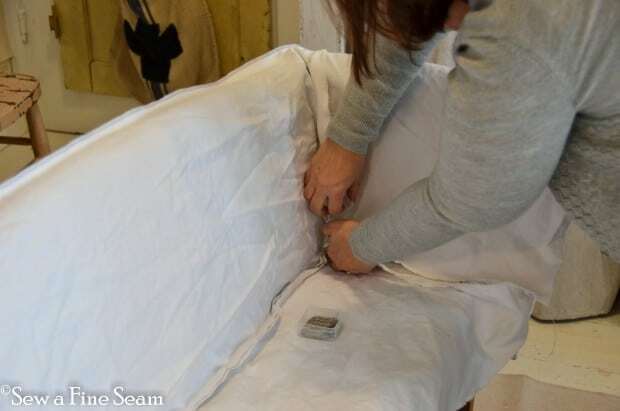 Laura has it figured out when it comes to using slip covers – you have two for each piece of furniture and when one goes into the wash you put the other on. Then when the one getting washed is all clean and sparkly you store it away till the next wash time! 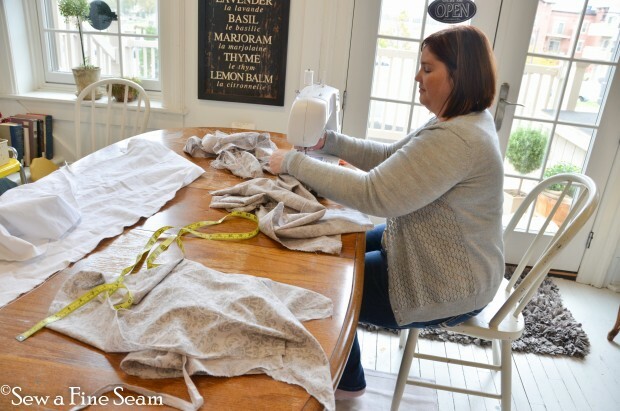 this grey print is the second fabric – I went ahead and tore my main pieces in both fabrics before sewing. For this one I thought the pattern needed to go up and down instead of sideways across the seat back. Since that was the width of the fabric and it wasn’t wide enough to fit the seat I cut 3 panels and sewed them together to get the direction of pattern in the fabric I wanted. I used 3 panels because the aesthetics are better with 3 than 2. 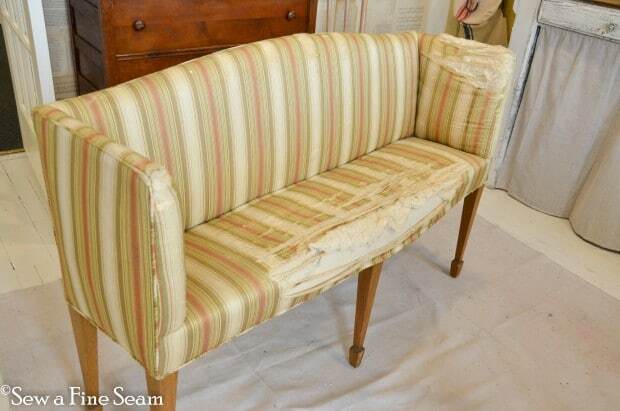 The first seam I sew is usually the back piece to the seat back piece. 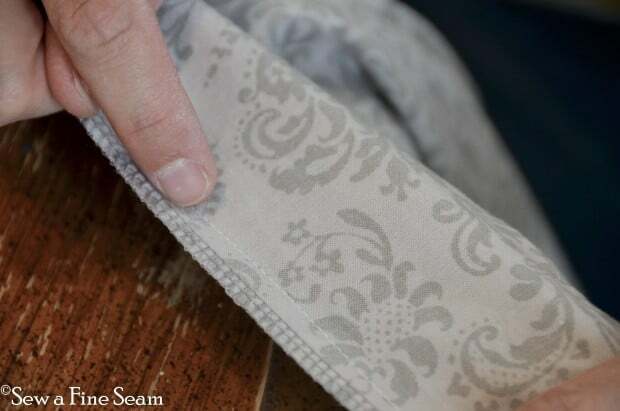 I pin the pieces together right on the furniture piece – right sides together – and I pin right where I want the seam to be. 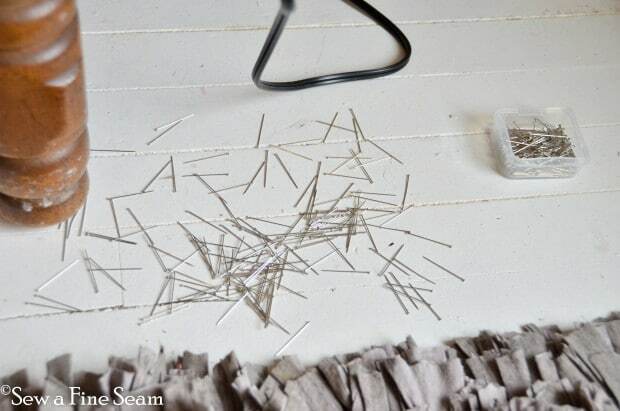 I take the pins out as I sew and the seam ends up right along the line where the pins were. 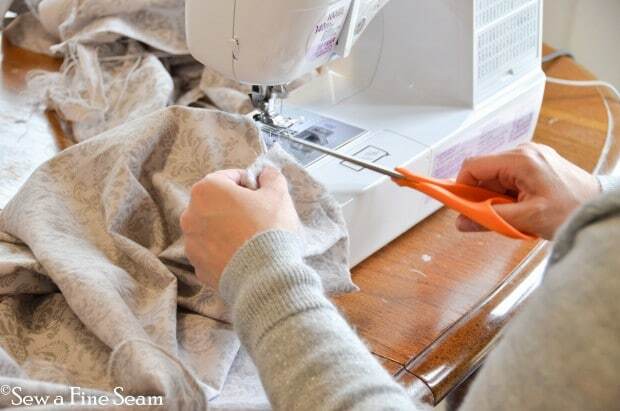 This seam is the most tricky. I just work with it till I get it pinned as good as I can and hope it works! I always turn the cover to the right side and try it on the piece like it will be finished before I trim and finish the seams. 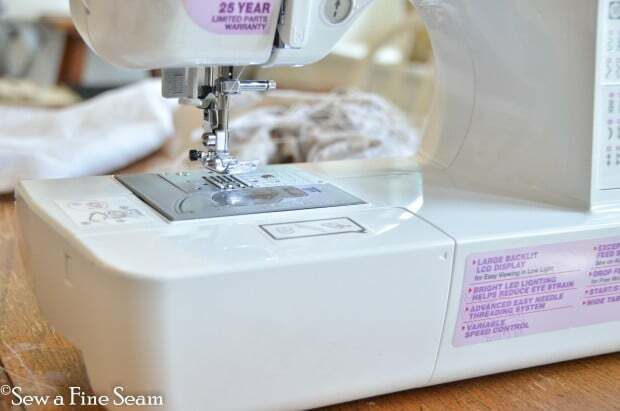 I didn’t take my sewing machine with me – it’s a bit hard on machines to be carted around, and Laura said her sis-in-law had one I could borrow. It worked great for me! I did take my serger along so I could finish the edges. My serger has been around for years and has finished more edges than any machine should be asked to. So I wasn’t worried about the trip being too hard on it. It did a fine job for me except for the last seam on the white cover. 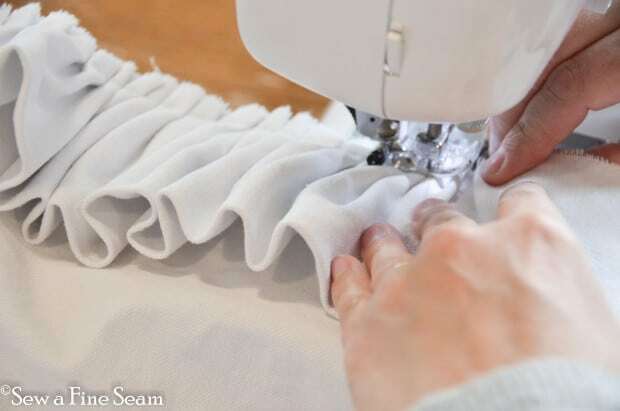 It would not go through all the thicknesses I had so I had to leave that seam unfinished. I was not pleased with that but it’s the way it had to be. 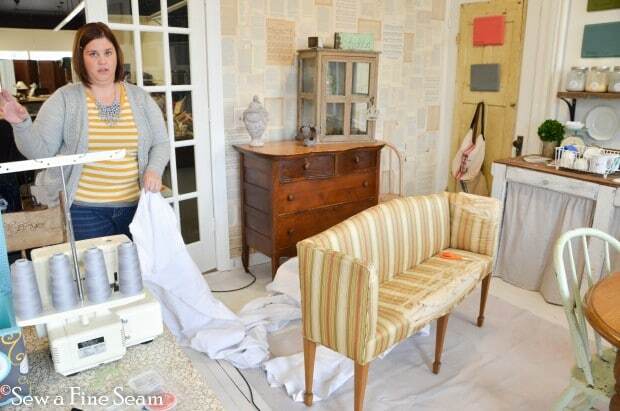 Here I am sewing in Laura’s lovely shop! She fondly calls it ‘The Nest’, short for The Ironstone Nest. I love it and I’d give a lot to have space just like it all my own! And here is the main cover all finished except for adding the ruffle which totally made it a fun, sassy slip cover! 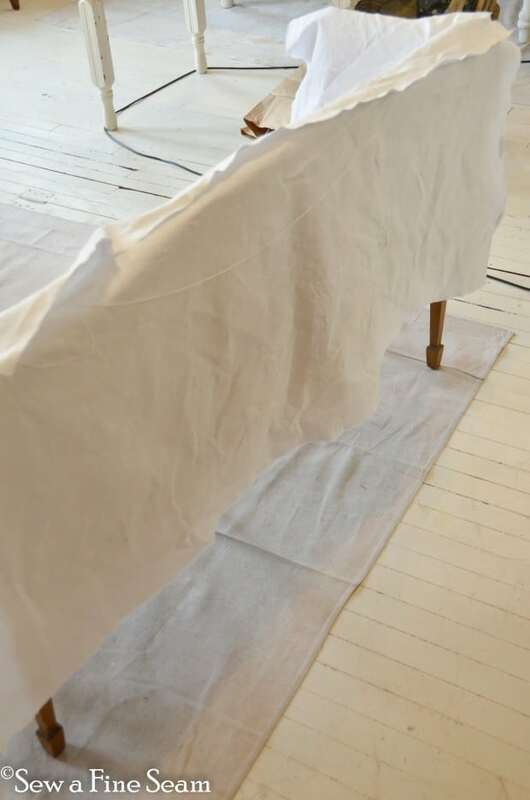 The fabric was a pure white cotton duck cloth which wears so well and looks SO nice! I doubled the ruffle so there wouldn’t be a hem at the bottom of it, which made for the extra thickness that my serger didn’t like. 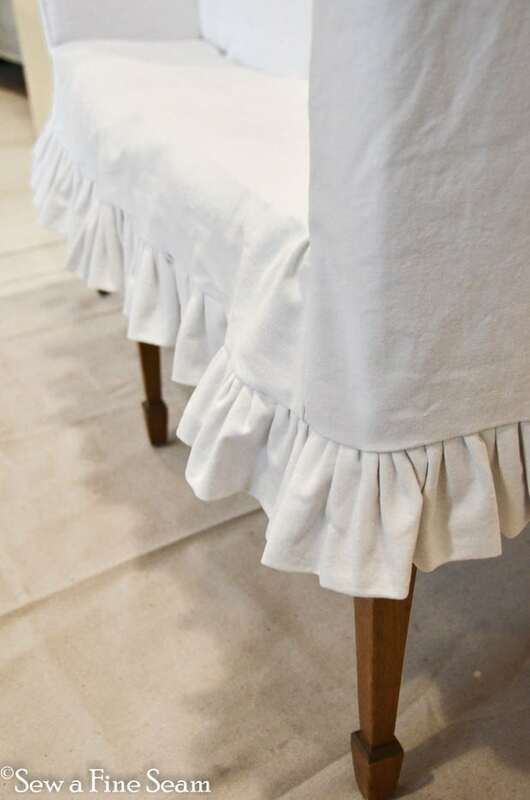 I also couldn’t get a gathering thread to draw up gathers (thankfully I though of that and tried a small section before I ran gathering threads through the whole thing and then found out ) so I sewed the ruffle on by creating the gathers by hand as I went. Not hard but took a bit of time. Towards the end of the day I managed to knock the box of pins on the floor. Laura picked them all up for me – she truly is a sweetheart! And I promise I really didn’t do it on purpose just to give her something to do!!! 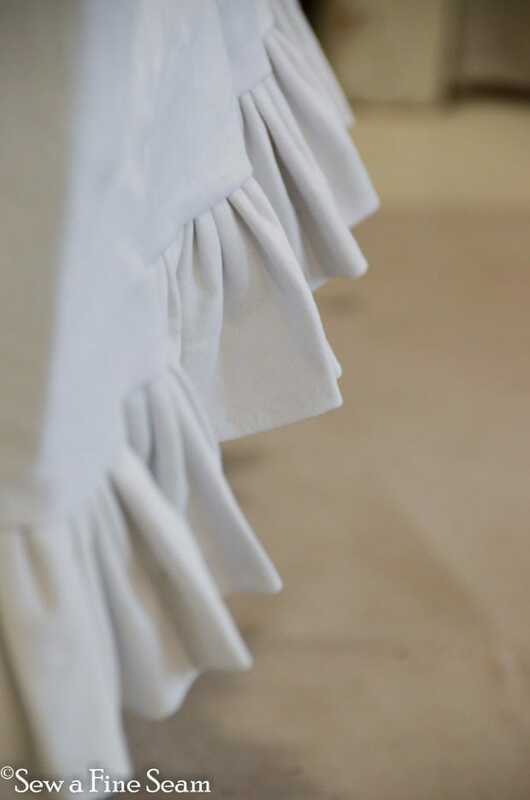 I love a good ruffle! And the grey – we didn’t do a ruffle on this one, just a wide flat band around the bottom to finish it off. 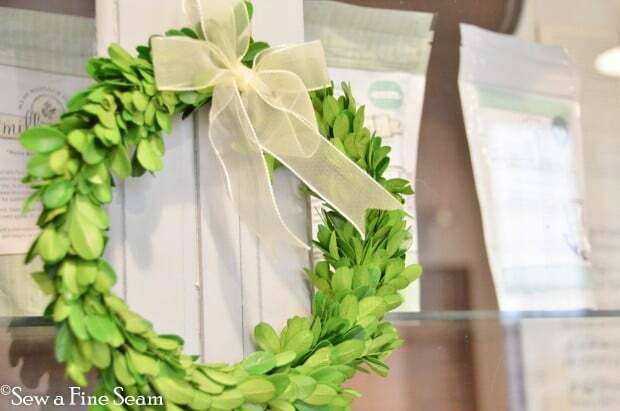 And here is just a bit more of the awesomeness of Laura’s shop. 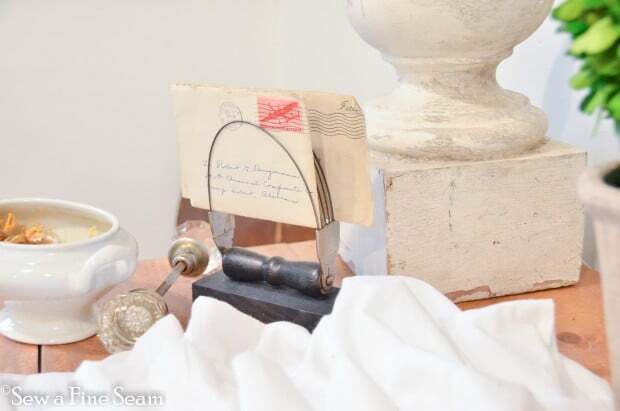 Isn’t the vintage utensil a great way to display old letters or cards? And here is the quick pic Emma snapped of Laura and I the next morning right before we left with our kids and she headed off to take her girls to school. 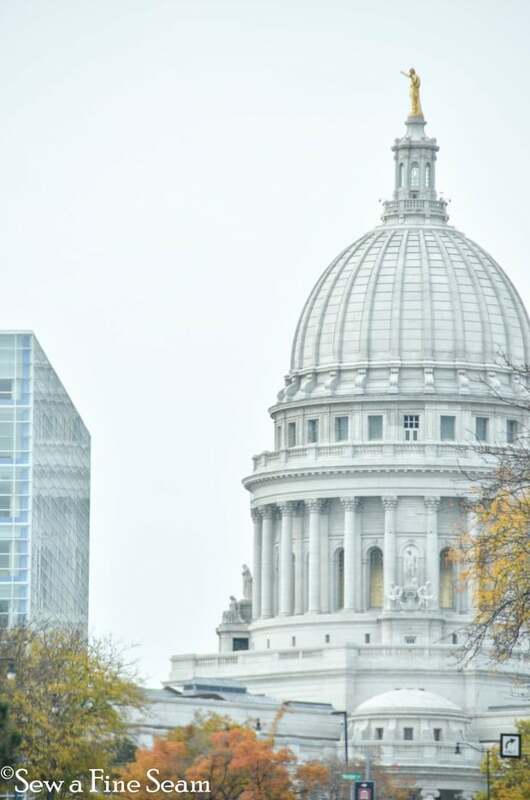 We headed to the capital – Madison – for a few days with the girls. First stop – the Capitol! SO cute, Jill ~ that ruffle is the most perfect addition, my friend! You are so inspirational! It would take me weeks just to get the nerve up to tackle that! You are speedy! 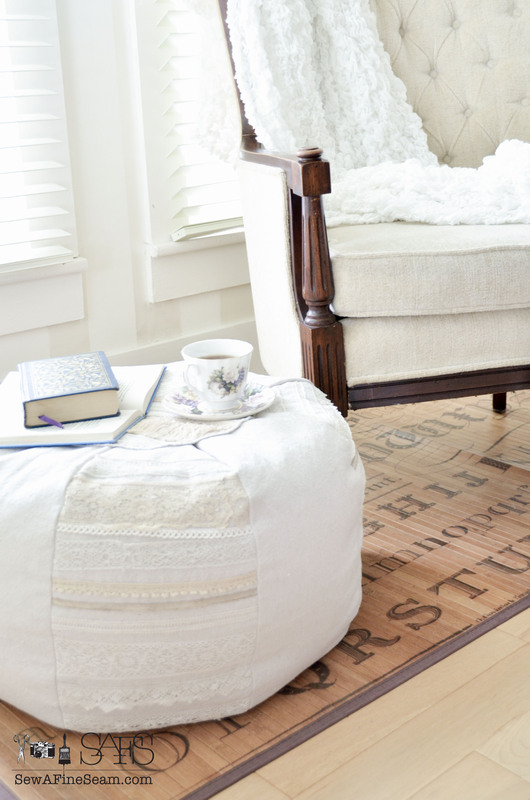 Super cute slipcovers! You are sooooo talented!!! 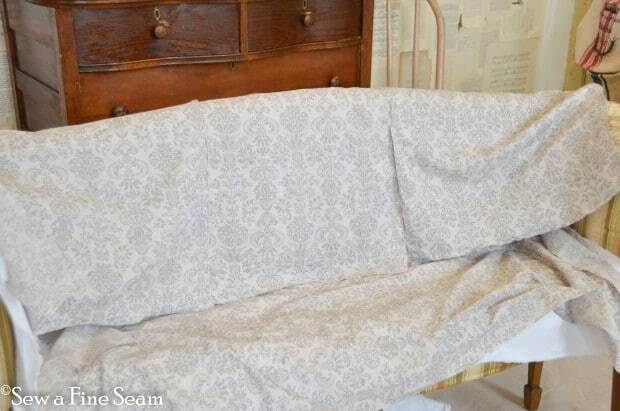 What I wouldn’t do to be able to whip up a slipcover like that!!! It takes me forever just to sew a pillow!! You made that look so easy Jill, how you did it makes sense. I’ll have to get busy and try that. I’ve been afraid to cut the fabric before I was really ready. Love how both the slip covers turned out, especially the white duck one. The ruffle really gives it personality. Love the soft look of the gray print. Bravo, great job. 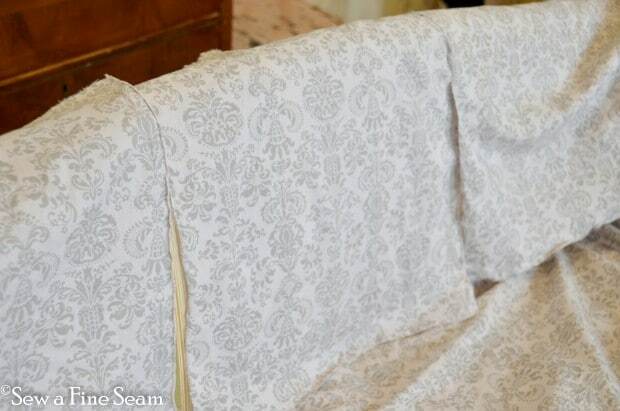 You have inspired me to try, finally, to make a slipcover for a club chair we have in our living room. It’s a really nice chair, good shape, I bought couple years ago from Habitat. It’s got plaid upholstery that does not go with our style. It’s really comfy but just don’t like how the plaid and our cat loves to sharpen his claws on it. I have the fabric, bought last year at Walmart. Maybe I could make a cover for a little foot stool I got on sale at Target few weeks ago. When I sit down I need to put my left leg up due to the pesty lymphodema in leg. 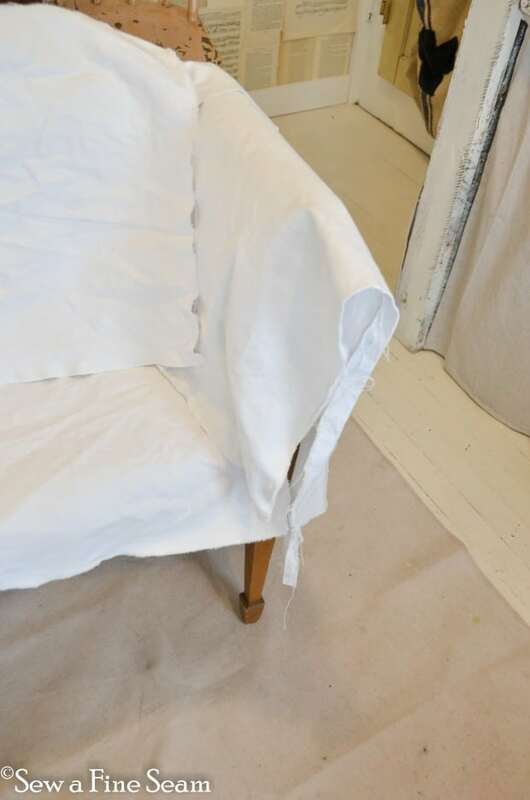 I was originally going to just staple the fabric to the chair and use nail heads to cover seams. Still undecided but would need to cut the fabric either way. Any suggestions? The fabric I bought is a heavy upholstery fabric, got little over 7 yds. Is that enough? Ok have great day. I’m thinking about doing some cutting on my fabric. JaneEllen, 7 yards should be more than enough! 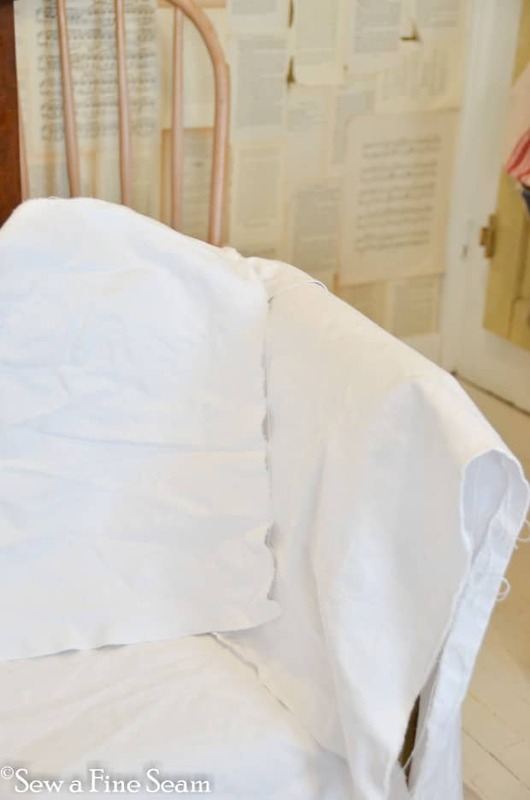 My biggest tip for your would be to send you over to Miss Mustard Seed’s blog and watch her video tutorials on creating a slipcover. 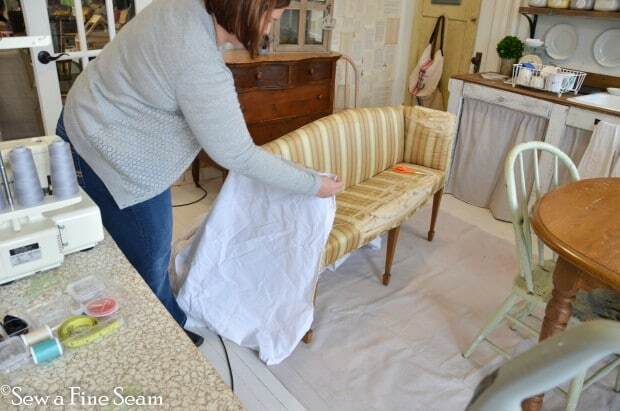 There are six of them that go through all the processes of making a slipcover. You should be able to find them in the right sidebar of her blog towards the bottom. If you can’t find them let me know and I will send you a link to them! Hope you had so much fun!!! 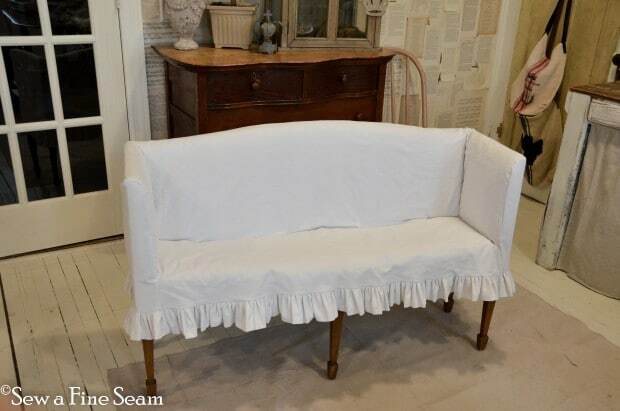 The bench turned out adorable, and I love the ruffled bottom. Great idea to have two! 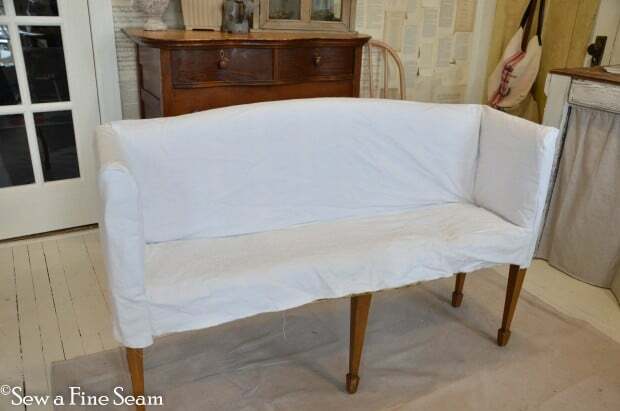 That bench slipcovered is very pretty! 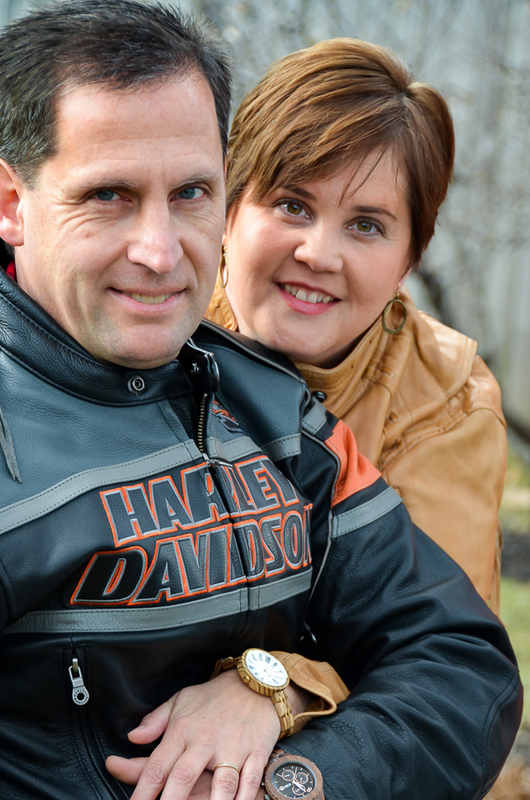 Finally getting caught up on your blog… awesome work my friend.. love it! Hi Jill! 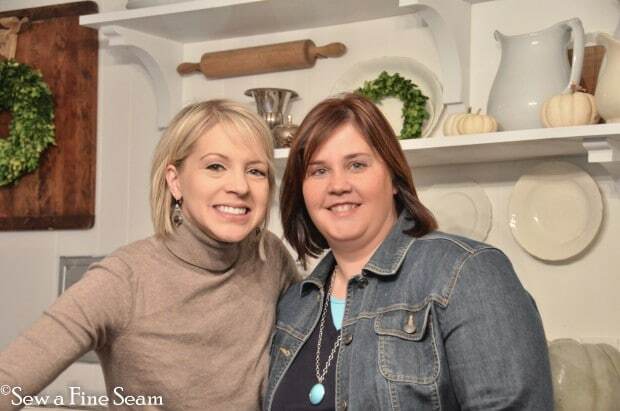 I’m thrilled to find your blog and know we have so much in common! 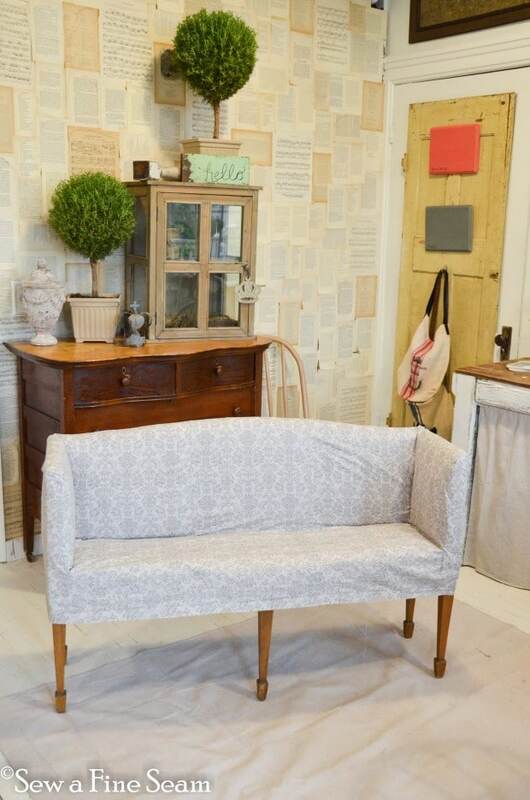 I began homeschooling my three kids this year and struggle to find a balance between my kids and doing the things I love, such as refinishing furniture and sewing and crafting. How do you manage it all? I love these slip covers! Beautiful job!